"Wow, Dena! You must have made a million different types of candy this year!" 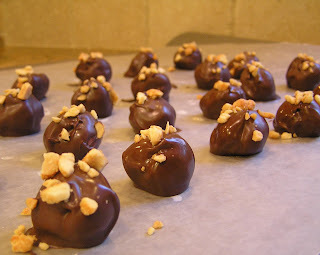 Especially these peanut butter balls. Or, as I call 'em, nature's most perfect food. Peanut butter has lots of protein. Chocolate is heart-healthy. And calories in powdered sugar don't count if you eat quickly (or standing up ... I forget which). 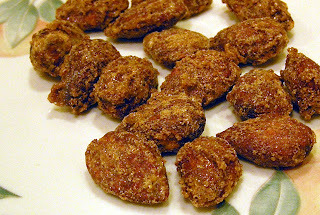 Time to go nuts ... for candied almonds. Or as we call it, almond crack. Be forewarned -- you will need to make two batches, one for gift-giving, and one for you if you make the "mistake" of testing a few before packing them up. In the out-of-focus background is one of the gift trays I made. Several of these trays, along with 15 (!) 1-pound boxes of candy, will be divvied out to theHubby's clients as Chanukah or other holiday gifts. I'll show more photos eventually (this is called a teaser, to get you curious and to increase the odds of you visiting this blog more often. Hope it works ...). Ever wanted to make lollipops, but thought you needed a special mould to make them? Me, neither ... until I spotted this recipe. 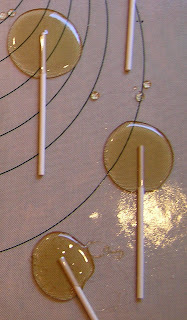 You can pour these lollipops freehand and they will pretty much self-form nice circles, with only a few less than perfect (as you can see above in the bottom lolly). This is a recipe that (according to Oh! You Cook!, not an authoritative source) the silicon baking mat was invented for. The lollipops will *pop* off so easily, you will kiss yourself (or whoever gave one to you) for owning this miracle of a mat. Despite the massive amount of Amaretto required (1/4 cup plus a little extra), the taste remains mild. I suggest not giving one to your favorite child. Not because of all that booze (almost all the alcohol boils off from the long boil-time and the small amount added after is equivalent to using extract), but because these babies are too good for the kiddies. 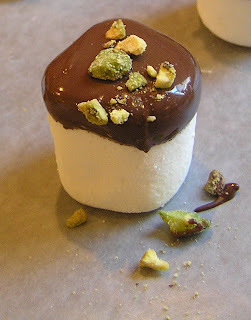 Chocolate-dipped marshmallows, just like chocolate-dipped pretzels, are very easy treats to make with the kids. Unlike chocolate-dipped pretzels, though, it's a bit easy to squish the marshmallows, so caution them (the kids, not the 'mallows) to be gentle. Keep a washcloth or five handy because no matter how careful you are, someone is eventually gonna stick a hand into the melted chocolate. Leave the silicone baking mat in the pantry drawer. No atomic heat is involved, except for nuking the chocolate. If you prefer, substitute chocolate chips mixed with a couple tablespoons vegetable shortening for the melting chocolate. As for the nuts, you will use very little if you buy them pre-chopped/sliced/slivered; so freeze leftovers for a future project. If you are nut-allergic but still want a showy result, sprinkle on a few shreds of coconut or jimmies. Or squiggle on some white chocolate for really fancy-schmancy results. 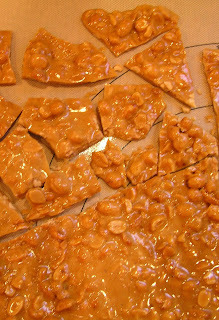 Peanut brittle is an old-fashion candy that is still popular today. According The Food Timeline, a real authoritative source for a change, recipes for candy made with groundnuts (as peanuts were then called) first appeared in 1847. The term brittle, however, wasn't used until almost 50 years later. I have been using this peanut brittle recipe for almost 10 years. It's more peanut than brittle. If you want something resembling the boxed stuff made who-knows-how-long-ago that you find at the supermarket, reduce the amount of peanuts by a half-cup. Many recipes call for buttering a foil-lined baking sheet, which can result in a tasty but greasy brittle. That is, unless you missed a spot while buttering. In which case you have peanut-and-foil brittle. Or as Snidely Whiplash puts it, "Curses! Foiled Again! ".